Press Democrat editor Ernest Finley had the cloudiest of crystal balls in 1904/1905. First he gave his paper's enthusiastic endorsement for the weakest presidential candidate in the 20th century (which really says something), then a few months later wrote the editorial below, proclaiming that "the so-called flying machine [will never be] useful for any practical purpose." Perdant un jour, perdant toujours. Finley's swipe at aviation was a comment on a story that appeared in the paper a day before, datelined July 18, 1905: "Professor John J. Montgomery's aeroplane, the 'Santa Clara,' collapsed this morning at an elevation of 3000 feet. Aeronaut Daniel Maloney was hurled to the ground, with the collapsed wings of the 'human bird' falling on him." As the pilot tumbled to his death, a crowd of 2,000 watched on. To be fair, Finley probably thought that the accident happened at the sort of air exhibition show that was common in 1905 all across America, where locals could pay for an ascension in a tethered hot-air balloon, then watch a parachutist make a jump. A balloon troupe visited Santa Rosa about a month later, in fact, as shown in the blurb below (although earlier that year, Prof. Hamilton wasn't touring with the lovely Miss Carrie, but instead a parachuting monkey named "Jocko"). 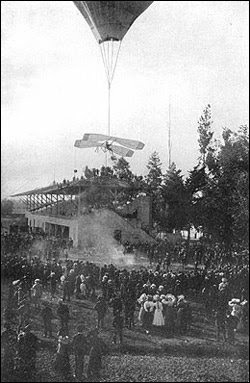 Here in July 1905, Montgomery and the pilot of his glider, Daniel John Maloney, an experienced aeronaut in the balloonist/parachutist vein, were demonstrating their aircraft before an audience in the (now-Silicon Valley) city of Santa Clara. The aircraft, named after the town and college where Prof. Montgomery taught, was pulled aloft about 4,000 feet by a hot-air balloon. Cut loose, he was expected to make a graceful, safe, and awe-inspiring bird-like descent that took up to half an hour. Practice sessions earlier that spring in Santa Cruz had gone very well. A picture-perfect trial demonstration at Santa Clara in April boosted confidence. But two discouraging failures followed, including a fund-raiser where the balloon rope snapped about 200 feet off the ground. The audience felt cheated and booed. On the next test flight on July 18, the largest audience yet watched as the aeroplane was pulled upwards. Montgomery reportedly noticed that one of the balloon's lines had damaged a wing, and shouted orders for Maloney to again abort the flight. His warning wasn't heard, or was ignored. As reported in the Press Democrat: "Maloney cut loose at 4,000 feet and began maneuvering the aeropane. He circled gracefully for some minutes, having the machine under perfect control. Suddenly the machine swerved, hesitated, and then turned completely over. It righted itself, sank down a considerable distance, and turned over again. Maloney was clinging desperately to his seat, and evidently endeavoring to regain his control, but all efforts were in vain. Again the aeroplane turned in the air, and this time the wings came together and the man and machine plunged straight downward." A little over two years from that moment, doubters like Finley would have to concede the practicality of aviation when the Wright Brothers made their first public flight in France. Adding a dose of irony to the editor's poor prognostication, in 1911 local pilot Fred J. Wiseman swooped over the farms between Petaluma and Santa Rosa in his experimental aircraft, and as a woman on the ground waved to him, Wiseman tossed something down to her that would become recorded as the world's first airmail delivery. It was a copy of the Press Democrat. Tuesday's shocking accident at Santa Clara, in which Aeronaut Maloney lost his life while attempting to manipulate Professor Montgomery's aeroplane, again emphasizes the difficulties that attend and must always attend any systematic attempt to navigate the air. Encouraged by the success reported to have been achieved by inventors in different parts of the world, many people have allowed themselves to become enthused to the point of predicting all kinds of impractical results in the line aerial navigation, but it is not at all likely that machines built for that purpose will ever develop beyond the toy stage. The favorite argument advanced in answer to this contention is to point to the things that have been accomplished in other lines, and say that many other inventions once considered equally impossible have been perfected and brought into general use, so why not the flying machine? This argument is manifestly unfair from the fact that the phonograph, the telephone and most of the other scientific attainments that come under that head have been new discoveries -- developments of ideas not only unperfected but also unthought of until such time as accidentally suggested by unforeseen and unexpected circumstances. The flight of the bird, on the other hand, is something man has been endeavoring to imitate ever since the eagle first stretched wing. If it were possible to endow a machine with intelligence and instinct, the successful flying machine might perhaps be numbered among the coming [line illegible] certain. The limited supporting power of the air itself and the consequently light and fragile method of construction that must in all cases be followed, together with the variability and uncertainty of the atmospheric conditions that have to be overcome, promise to continue to baffle human ingenuity in the future as they have in the past, and no matter how highly perfected, forever prevent the so-called flying machine from becoming useful for any practical purpose.